Nothing But A Great Time At The Rapids!! 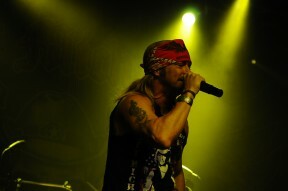 A stellar performance by Bret Michaels and company at the Rapids Theatre this past Thursday. This marked the first time Bret has played the Falls in his illustrious career. Not only did Bret put on one of his best sounding shows ever in the Buffalo area, but he treated the crowd to what appeared to be an extended set as well. The band seems to be firing on all cylinders right now even with bassist Ray Scheuring hindered a bit by a fractured ankle/fibula that required surgery. Launching with the Poison standard “Talk Dirty To Me”, the band followed with perhaps his best solo tune “Bittersweet”. It was a great move incorporating the tune early in the set to help distinguish the difference between A Bret Solo Show and a Poison show. As the show proceeded forward, the usual Poison standards “Your Mama Don’t Dance” and “Unskinny Bop” appeared. “Go That Far” the theme from Bret’s VH1 reality show Rock Of Love had the females in the crowd bopping along. “Fallen Angel” one of the few Poison songs that never seem to get old closed out the main set. As Bret returned for the encore of “Nothin’ But A Good Time”, the show ended quite appropriately. Bret Michaels seems to thrive on being on the road. He usually visits the area with Poison in the summer out at Darien Lake and his solo band each annually. The one thing I would say to him is to try and keep the show fresh. We all know Poison’s set list has grown quite stale with the same old set year after year. The solo band is where Bret can change things up. Perhaps playing Poison songs such as “Cry Tough”, “Let It Play”, “Love On The Rocks” and “Let Me Go To The Show” for example would keep the fans coming back for more. He has the band and guitarist in Pete Evick to pull off just about anything should he want to.